The video below was produced by Kati Morton who's one of my favorite YouTube therapists. In the video, she discusses six dialectical behavior therapy (DBT) distraction techniques which will help us change our life for the better. If you've asked the question, what is DBT, you'll get a better understanding of it after viewing the video. She talks about how we can distract ourselves using simple methods, instead of hurting ourselves or causing pain to the other people in our life. The text below was written by Kati and edited by Ramiro Rodriguez. Most of the text is the same as in Kati's YouTube channel, I simply reworked some parts so I don't get in trouble with Google for pasting text verbatim. You ask and you shall receive! In this video I talk about six distraction tools as well as how to create a distraction plan which will help you change your life for the better. I would encourage all of you to grab a few 3x5 cards to help you create your life changing plan. Using the six tips outlined below, you can come up with different distractions to use regardless of what time of day it is or where you are. Put your ideas on your card and keep it with you at all times. Use safe alternatives to self-harm behaviors. Think about someone else! Make up a story about the people you see. Distract by leaving! If you have self harm items around you and you are struggling to fight the urges, get out of there! I hope you find this helpful and are able to use this to fight back against those self-harm or even negative depression voices! I've always said you get to know who your friends are when you're in jail or you're in the hospital. Having said that, I can say without a doubt, I have two close friends. One of those friends is Ignacio Núñez who is running for mayor of San Francisco. He's on the 'write in' ballot and he has no chance of winning, but he's put in all the leg work to get in the race for mayor. At any rate, Ignacio Came to visit yesterday. He'd been smoking marijuana and he laughed uncontrollably at some points. It was a fun visit. I hope he comes back this weekend. I'm going to call him later to see what's going on. I'm currently a patient at San Francisco General Hospital. I came in for surgery yesterday, and I'll be here at least five days according to one of the doctors. It's going to be a tough five days. 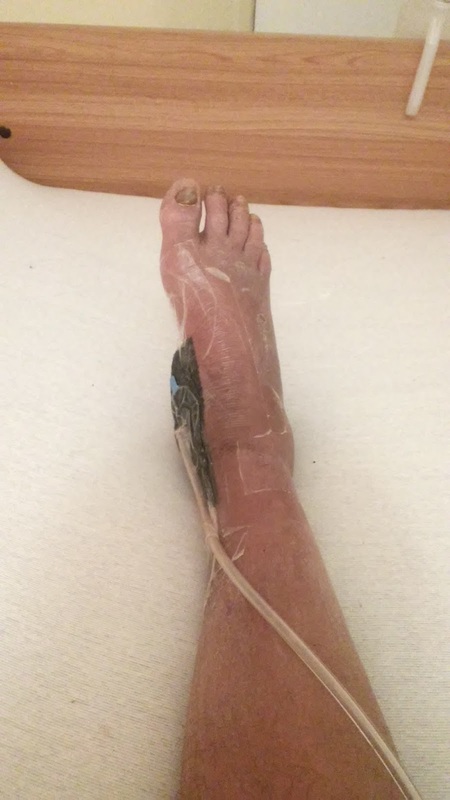 The doctors performed a skin graft and they lengthened my achilles tendon. It doesn't hurt as much as I thought it would. In fact, I don't feel any pain when I take my pain meds. If I begin to feel a little pain, I can ask for a breakthrough pain med and that usually stops the pain before it gets worse. The hospital changed it's procedures since a patient went missing last year and it now closes individual units, which helps nurses keep track of who enters and exits each unit. They also changed some of the things patients can and cannot do. One of the new rules is patients cannot leave the hospital. I'm not sure if we can leave with a visitor, but I know we cannot go off the unit alone. My nurse told me we're not allowed out, but we can walk around inside the unit. Patients who are in a wheelchair can cruise around the unit. Something I've been to doing to help me change my life is I stopped judging myself harshly and I have to say it makes a big difference! I am nicer to myself and I am more accepting of other people. It's a great way to live. Practicing self-compassion isn't difficult. You simply treat yourself as you would a friend. You're nicer to yourself and you give yourself advice just as you would if someone came to you for help. Please be sure to post a comment and include a link to your website so I can visit your site. I post comments on sites I visit so if you post a comment here... I'll do the same. If you want to change your life give out what you want most because it will come back to you. I'm not saying that just to have something to write about. I've experienced giving and receiving many many times during the last couple decades. When I first began giving away money in 1992 I was earning $10 an hour. Every week I would give away ten percent of my income and in a few months I got another job earning $12 an hour. I've also given away drugs and received drugs in return. The universe operates via universal laws one of which is called tithing. Simply give away ten percent of your income if you want money and you'll get more money. There is abundance in world. You just have to learn to follow immutable laws to get what you want to change your life. I'm still a patient at the San Francisco Nursing Center. Today during dinner we learned the facility ran out if coffee. David, my roommate, is in disbelief. He said, "How can a place like this run out of coffee!? Who runs out of coffee? Allowing the coffee reserves to run out is an indication of poor planning by management and it's an indication that the kitchen employees don't care. We were offered tea with dinner instead of the coffee we normally get. And we're getting tea with the eight o'clock snacks. I'm sure management will purchase coffee tomorrow which is Monday. Let's hope it doesn't happen again. Most of know we have to change our thoughts if we want to change our life and the article below confirms that theory. When we change our thinking we also change the way we view the world, so things that bothered us in the past, no longer matter. The article is pretty lengthy but well worth the time it takes to read because it teaches us how to look into our past to see how our upbringing affects us as adults. There is a link at the end of the text you can use yo continue reading the article. Before reading the article, you may want to watch the video below. It explains CBT and it's only about 10 minutes long. It's well worth the effort to watch the video as you'll gain a deeper understanding of cognitive behavioral therapy. By Monica A. Frank, Ph.D.
As you may realize as you read the articles on this site, the underlying core issue for many problems resides with irrational thinking styles. That, of course, is the basic premise of cognitive-behavioral therapy (CBT). We develop styles of thinking based upon our learning experiences, our parents' thinking, and societal/community beliefs and expectations. 1) Learning Experiences. When we are growing up, we have many experiences and the outcome of these experiences contribute to beliefs or ways of thinking that we develop. For instance, as a child I was very shy and fearful of speaking in public due to fear of making a mistake and being ridiculed. In the 7th grade I had a teacher who encouraged me to attend speech competitions. I was so excited that she thought I could be good at this that I was willing to face my fear and engage in speech competitions which I continued even throughout high school. As a result, I developed the belief "Even though talking in front of people causes anxiety I am capable of doing it." Now, if I had not had that experience and my main experience was being embarrassed in front of my class because I couldn't say the word "peculiar" when I was reading out loud (it sounds different than it looks and I couldn't get my brain to switch from the visual to the auditory because I was so anxious), I may have developed the belief "Talking in front of people leads to embarrassment which I must avoid." The problem that causes this belief to be irrational is that it is black and white--it leaves no room for alternatives. I would be assuming that talking in front of people always leads to embarrassment. Instead, by doing speech competitions I learned that talking in front of people could be enjoyable and could lead to awards. Trauma is an important subset of learning experiences that severely affects an individual's belief system. For example, an individual who survived a fire has a fear of low probability catastrophes. Due to the fact that a low probability catastrophe occurred to him or her, it is more difficult to challenge the thinking with a statement such as "It is unlikely to occur." Or a person who was raped and then told it was her fault because she left her door unlocked may tend to unreasonably blame herself for things that happen. Parents' Thinking. Sometimes our parents teach us irrational thinking directly such as "What would the neighbors think?" if they saw a dirty house implying that the neighbors would think we are bad people because the dishes aren't done and the beds aren't made. They may catastrophize about situations and pass their worries onto us "I don't want to fly because the airplane might crash." Often, they don't recognize that their thinking is irrational and so they don't tell us there might be alternative ways to think. For instance, they don't typically say "I have an irrational fear of crashing but airplance travel is actually the safest form of travel. Even if our parents don't directly tell us how to think, they impart certain ways of thinking based on their behavior and how they handle situations. For instance, I remember my father speeding past a bunch of cars and then coming to a stoplight which caused all the cars he had passed to catch up with him and he slammed his hand on the steering wheel and said "They're all laughing at me." At first I was confused, but then I came to understand what he meant and that others laughing at him was a catastrophe. From this I came to learn that I had to be careful in how I behaved so that people wouldn't have the opportunity to laugh at me. 3) Societal/Community Beliefs and Expectations. We learn a great deal of thinking based on the culture we grow up in. For instance, a professor of mine once described his experience as a teacher in the Virgin Islands. He said they did not have the same concept of time that we do in the U.S. College students in the U.S. typically arrive to class on time but as soon as the class is over they are out the door even if the instructor is in mid-sentence. However, in the Virgin Islands college students might arrive 20-30 minutes late but they also tended to stay longer and be involved in discussions after class. Neither of these scenarios are right or wrong, they are just different behaviors based upon cultural influences. However, sometimes those societal beliefs and expectations can lead to problematic behaviors. Therefore, due to these various influences we develop our thinking styles, both rational and irrational. You may already recognize some of your irrational thinking styles and how they developed, but you want to know, "How do I change this thinking?" In fact, many times you've probably have had people tell you "Think this way!" But no one tells you how to "Think this way!" So, you still have the question, "How do I think that way?" The answer is that you are already halfway there. Half of the battle is recognizing the thinking that is problematic for you. You can do this by reading other articles on this site as well as the recommended books. The next step however, is the part that requires more active work and that is challenging the thinking, repeatedly and often. This part of therapy is known as "cognitive restructuring" and can change your life for the better. To learn any new skill, we first have to identify how to complete the skill correctly and then we have to practice the skill repeatedly. So, for instance, if you want to learn how to hit a ball with a bat, you need to learn how to hold the bat and how to stand and when to swing. But, just because you know intellectually how to hit a ball doesn't mean that you will be able to. The next step is to practice swinging the bat at the ball and adjusting your stance until you can hit the ball. However, even then it doesn't mean that you can automatically hit the ball whenever it is thrown to you. At this point you need to practice swinging the bat at the ball again and again until you develop the muscle memory to do it automatically. That way, when you are under the stress of two outs in the ninth inning, you will be able to automatically engage in the behavior you need to hit the ball. Well, learning a new way of thinking is learning a new thinking skill and the process is the same as learning to hit a ball with a bat. You need to identify the thinking you want to learn and then you need to engage in it repeatedly until it becomes automatically. Just as your body doesn't feel comfortable at first when you are learning to hit a ball, your brain doesn't feel comfortable at first with a new way of thinking. However, the more you engage the new thinking, the more comfortable you will become with it and the more you will believe it and be able to rely on it. The most difficult part of creating the new way of rational thinking for most people is the repetitive practice. Some people, however, may have difficulty with recognizing how their thinking is irrational. In which case they may need further assistance from a therapist. However, for everyone else, the process at this point is to develop methods of practice. Long ago someone asked me how much money I needed to live my life without working or depending on a check to arrive in the mail. I answered the question by saying, "As much as I can get." And I meant it. Money is a funny thing. Most rich people give it away because they know it'll come back tenfold, while poor people complain they don't have enough money to live on or to purchase food. And there are the newspapers that report how the poor are getting poorer and the rich are getting richer but they don't offer solutions. There is a solution. The world is full of abundance in everything you see. Look at how many people there are on the planet. Look at the abundance of trees and grass. And there is an abundance of stars and planets. The same is true about money. You can have as much or as little as you want or need. You just need to know how to get it. I have money all the time and I don't work nor do I receive a check. I always have money because I think I do. We live in a world that is controlled by thoughts. What we think about most is what we get. It's as simple as that. I speak from experience. I've been practicing and experimenting with mind control for more than 25 years and I've been able to create miracles in my life. One of the reasons it's so hard to get off drugs or change other habits us because we think about them constantly. And we get what we think about. The only way I've been able to change my life for the better in the past, or create something I desired, is by saying an affirmation over and over for 10 minutes without stopping. Affirmations are powerful. When you say something over and over, it gains power and continues to grow until it manifests in your life. You can make miracles happen with only your thoughts. A while ago I read about a man who was able to increase his self-confidence simply by saying, "I am confident, I express confidence outwardly." He repeated the affirmation for ten minutes every day, and before long, he was dating women and enjoying life more. If you want to change your life by increasing your income, begin giving away ten percent of everything you earn. It works because it's a spiritual law called tithing. I've experienced it more than once so I know it works well. When I began giving away ten percent of my income, I was earning $10 an hour. After only 2 or 3 months of tithing, I began to earn $12 an hour. My income slowly increased to $15 simply because I gave some of it away. Thanks for visiting the Trying to Change My Life blog. Please be sure to post a comment below and include your website link so I can do the same. I created the blue water abstract image below with two apps from the Google Play store. I am a student of digital art so I practice creating these pictures almost every day. It is my way of changing my life and it seems to be working. I am a lifelong drug addict and it's hard to overcome such an addiction. I had my first drink when I was 11 years old or younger and I just kept going. When I was 12 I started smoking marijuana and taking pills. My parents didn't find out I was doing drugs for a long time. And by then, I was addicted to marijuana and beer. In my twenties I started drinking Puerto Rican rum and by my late thirties I was drinking a half gallon of vodka a day. I'm feeling pretty good right now because my friend Ignacio Núñez just left. He came to visit for the second time in less than a week. And, thankfully, he brought me a cigarette. Ignacio is running for mayor of San Francisco. He has all the signatures he needs to get on the ballot. He won't win, but he could disrupt the election. My roommate here at the San Francisco Nursing Center and I were talking about how to tell who your friends really are. If you're in the hospital or in jail, your real friends will write to you or visit if you're in the same city. I have a serious decision to make soon. Part of getting off drugs and changing your life is letting go of friends that are still using narcotics. It's hard enough to change your life when you're alone so it is almost impossible if you're still hanging around people that use drugs. I took the picture below with a kaleidoscope app. I like the way my eyes look. It's scary and curious at the same time. This picture was taken weeks ago, but I don't remember posting it here on this blog. If you see it on another page, please let me know. Today is Sunday, October 18th, and it's close to lunch time here at the San Francisco Nursing Center . About an hour ago I had to fight with the kitchen staff so I could get a something to eat. Let me explain. Every day at ten in the morning we're supposed to get snacks. Today I didn't get a snack, and because I was asleep, I didn't get to tell anyone until 11 a.m. When I went to the kitchen asking for my snack, someone in the back said, "It's eleven so we're not doing any more snacks. Of course I didn't go for that. I demanded something to eat and I finally received four cookies. Someone in the kitchen staff is in trouble. One of the administrators asked me what occurred so he could write a report of the incident. He also apologized to me. I hope you enjoy the abstract image above. I call it the Eyes Looking at You. These kinds of images are very easy to make. 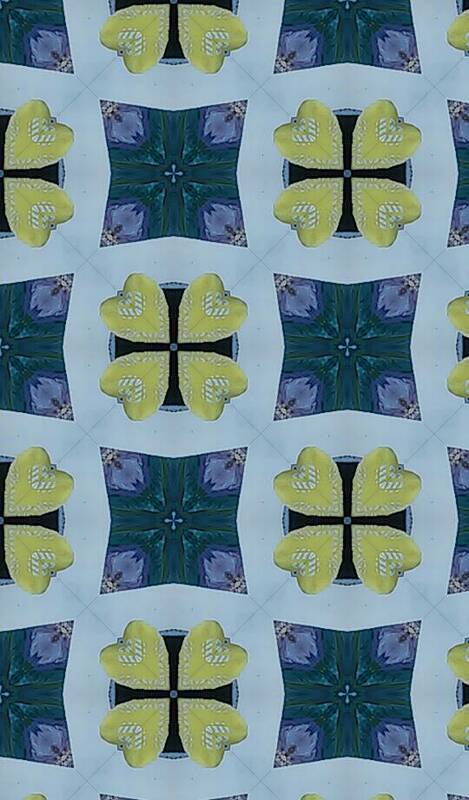 I used a kaleidoscope app from Google Play. I thoroughly enjoy creating these abstract images. The time simply flies by when I work on creating images and when I write these blog posts so I can be as busy as I want to be. It is 6:45 p.m. here in San Francisco and I'm bored so I decided to work on this blog post. I'm trying to change my life so I don't do drugs any longer and I don't drink alcohol. I'm excited and scared at the same time because of an upcoming surgery date. I'm excited because the podiatrist scheduled the surgery for the skin graft and I'm scared because she's going to lengthen my Achilles tendon. I sent an email to my primary care provider expressing my concern about the tendon lengthening and she said not to worry. My PCP said it's necessary to lengthen the tendon so I have full range of motion in my right leg. The picture above contains the preoperative instructions I received from the podiatrist. I have to meet with the anesthesia doctor before surgery and I have to do a couple other things as well. Today is Friday, October 16th. I've had a very busy week and I'm glad the weekend is here. I plan to relax this weekend by not doing too much work. Maybe I'll work on some digital art to post next week. I wrote about 8 articles this week and I published more than 20 abstract images some on ricoramiro DeviantArt and some on ricoramiro.PicsArt. I hope you're enjoying the three kittens as much as I did when I posted this picture. The kittens are adorable, especially the first one. The video below is of one of the courtyards at the San Francisco Nursing Center. They have two courtyards in the facility both of which get used a lot mainly by the interns and the staff that smoke cigarettes. The images below are of the second courtyard at the San Francisco Nursing Center. It's a decent facility. I'm glad I landed here. The fact that it's a nice place means someone somewhere is looking out for me. Image Credit: ricoramiro @ PicsArt.com. I hope you're having a great day today. It's 3:10 here in San Francisco which means it is after 6 p.m. on the east coast. I'm still here at the San Francisco Nursing Center. I got a new roommate named David... he's a pretty cool guy. He claims he 70 years old, but he doesn't look a day over 60. I'll see if I can finagal a picture of him for this blog. I posted the above abstract image here because it reminds me of royalty. I think purple is a color used my the royal family. At any rate, thanks for visiting my blog Trying to Change My Life. I'm really glad you're here and I hope you enjoy my posts. I hope you enjoy this picture of my ricoramiro eyes. 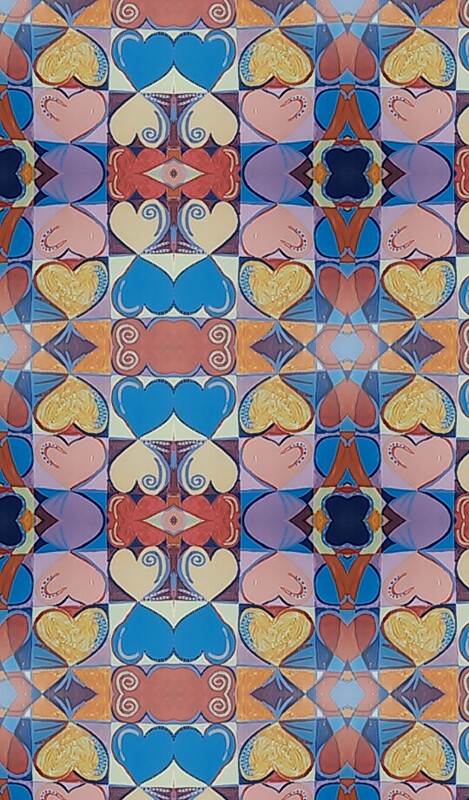 I just took the picture with a kaleidoscope app from the Google Play Store. They say the eyes are the window to the soul. That may be true... to a certain extant. The eyes can tell us when we're angry, happy and sad. But can the eyes tell us when we're hurt? How often have you seen someone and known immediately something was wrong, but you couldn't put your finger on it? Probably a lot. As humans, we can be as revealing or as secretive as we wish. Simply smile and the world thinks you're happy. Put on a sad face and the world knows you're sad. The image below is hosted on Cloudup.com. 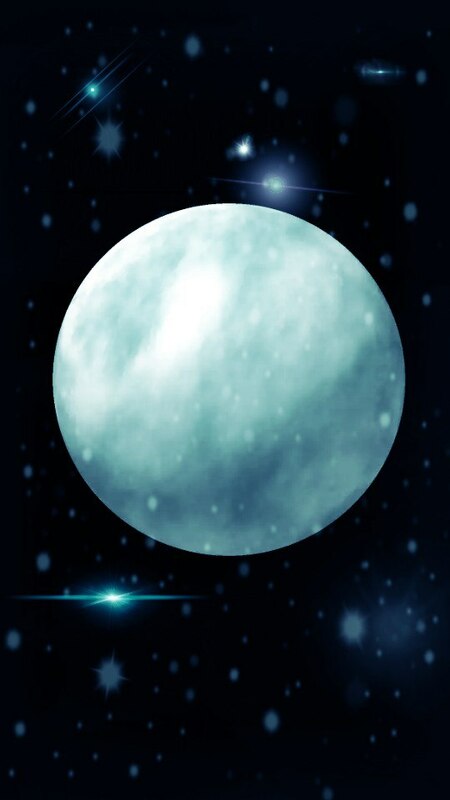 Both images are 540×922 so they can be used as Android backgrounds. This abstract is pretty. I like the yellow hearts in the light blue background. I just got caught smoking outside here at the San Francisco Nursing Center . The administrator came out the back door and caught me red handed. Or I should say with a cigarette in my hand. I should have said that everyone smokes outside but I apologized instead. No need to throw everyone under the bus 😉. I'm sure I'll get caught again because if he caught me, he'll catch other people too. I've actually been doing well controlling my urges to smoke because it's part of my plan to change my life. I've been using mindfulness to help me learn how to control the urges to smoke and it's been working well. Thanks for visiting this Trying to Change My Life blog. 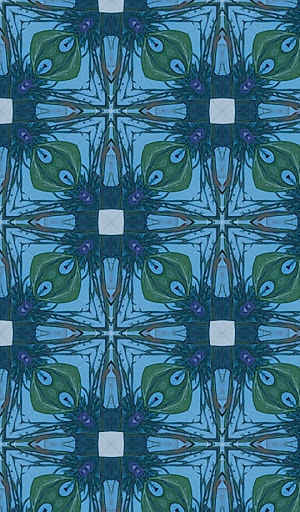 I created this blue green patterned abstract image using a kaleidoscope app from Google Play. I simply enjoy creating these images because it keeps me busy and it's a great hobby. And, believe it or not, creating abstract images is helping me change my life for the better. I've been off meth for more than thirty days and I don't have any cravings. Art therapy is a class that's offered at most drug and alcohol rehabilitation centers because it is extremely effective at helping clients pursue other interets. One of the biggest challenges addicts face upon graduation from rehab is finding something they can do with their time. Clients who are not employed are especially prone to relapse simply because they have too much time on their hands. I plan to pursue creating abstract images and I may even get into photography. Creating content if that nature is very rewarding and it's an easy way to help others as we all need our picture taken once and a while. Wahoo! I don't have to do anymore physical therapy. I just met with the woman in charge of the physical therapy department and she said, "At this point, we're just waiting for your wound to heal so we won't do anymore therapy. That's a good thing. Their exercises were hurting the wound more than helping. I can't even do a simple ankle roll without causing pain! I hope they don't call me back. Today is a day I wish would be over sooner rather than later. My wound is hurting something fierce today to the point it is throbbing. It actually began hurting last night but I didn't feel it as much because I took a morphine pill and my psych meds, and went out like a lightbulb with no power. I smoked some weed earlier today to see if it would ease the pain and it did. The marijuana worked well as a pain relief option. My wound isn't throbbing any more which is right on time. I asked for pain meds earlier and they should kick-in before the marijuana wears off. I know I'm supposed to get off drugs to change my life but I simply cannot function with the pain. Sometimes I can't sleep it hurts so much. Aside from the pain, the wound is healing well. The woundvac is doing an excellent job at accelerating the healing process even though it's been acting up lately. It's been getting loud and temperamental. Sometimes the woundvac will beep then indicate it is low on battery power or it will beep then stop. I've started to turn it on and off when it acts up which usually fixes the beeping noise. The wound will heal well and I'll be able to change my life for the better. Lately, I've been learning how to do without cigarettes when I get an urge to smoke. It's a great tool because I can't smoke regularly here at SFNC and I have to be able to control my response to urges to light a cigarette. It's also a great tool because I don't go on a hunt for cigarettes if I don't have any. To help me better control the urges to smoke, I use a mindfulness trick. I allow the urge to become as strong as it can and I just watch it. I can see it floating above my body and I realize I don't have to act on it. Watching the urge becomes the fix. Of course that's easier said than done and I've failed more than I succeeded... but the successes I've had show me it is possible to change. Mindfulness is about observing something with complete acceptance and without judging which makes it easier for us to understand we have options. These yellow abstract images were created using the digital art app from PicsArt.com. the software is a lot of fun and it empowers anyone to become a digital artist.